A colluege of mine has a nice use case for his old iPad2 – he uses that for displaying the music. So he doesn’t have to carry all the paper when rehearsing or performing. So I started an evaluation. Because I don’t own a tablet I am not fit to a special device. There are mainly three different platforms you could use: t dAndroid, Windows 8 RT and iPad. For the first two you can choose between several devices and sizes while the iPad is (still) available at 10.1″. With 13″ you could use only Android or WinRT at the moment. Apple had announced bigger devices and Samsung did that also, but I am curious NOW :O. To be honest I am not sure about using Windows on a tablet … maybe I am prestressed from my old mobile running Windows Mobile. So now I had to search for candidates available in Germany (where I live). 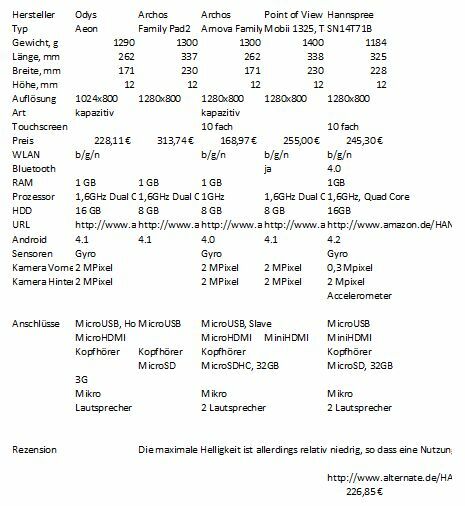 A little bit googling gave me: Odys Aeon, Archos Family Pad2, Archos Arnova Family Pad, Point of View Graphics Mobii 1325 Tab-P 1325 and the Hannspree SN14T71B. From that table I choosed the Hannspree due its good hardware data. After that I did some searches again for a better price than the 245,30 € at Amazon and found 226,85 € at Atelco. After only a few days I got the tablet. First impression of that tablet is: big. Reminds me on my 15″ notebook. But directly comparing with that the Hannspree is not all big as the notebook. And it’s much thinner. What I dont like is the power adapter. It is not an USB one (the tablet has two micro USB ports) – it’s a propriety one. A real evaluation would have to evaluate multiple music readers. But I found Mobile Sheets it impressed me: you could to much of what you are doing with paper, behind that tool there is programmer who is very responsible in the tools forum and there is a free ‚test‘ version (full features but limited songs). Installation is done via Google Play Store very quickly. And there are some points I had written in the forum – u.a. as error feedback to the programmer. Very nice: only two days later I had a good feedback from the programmer. #60: MS supports image rotation. This is done via double-tipping. Maybe an alternative would be more intuitive: place two fingers on the tablet a let them rotate. Answer:v5 is adding rotation support where you can rotate any amount you want. This will be done with a slider on the song editor screen (with the ability to enter a value manually if desired). #61: You could configure how to activate the overlap. Default is a single tap. Because chances increase that a simple „next page“ results in activating the overlap, I suggest having a „double-tap“ or „long-tap“ as default. (There was a forum entry here which shows how to configure that behaviour.) Answer: There are already three overlay modes available in MobileSheets. If you look under the options for these overlay settings, you have the option for single tap, long tap, or swipe. #62: Just in idea: improve the AutoScroll and the Metronome by supplying more information. The user could mark the area which build a „line“ in the music and save how many measures this line would include. Additional information is the tempo (which defaults to the tempo of the previous line and finally in the tempo of the song). AutoScroll could use this information for calculating the time which is needed for playing one line. Also AutoScroll could ignore not marked lines (because they dont contain music).Anwer: These are good ideas. I am introducing more advanced auto-scrolling options, but I didn’t really think about adjusting the metronome mid-song. In a future update, I will look into adding these capabilities. Preload of the Setlist. Having all songs loaded into memory would speed up page-turning. If it is not possible to load the entire setlist (maybe to less memory) preloading the next page and holding the last page would also tune the speed. Answer: I already load up to 10 pages in each direction from the current page. Even this can cause problems on some devices with limited resources. Multi display support. As the price for tablets decrease you could choose the trend using more „commodity hardware“ instead of „high end hardware“. You could combine multible tablets for building one „big“ display. You have to store where each of the tablets is (like dual monitor support in desktop operating systems). Then input and output could be done via all displays. One of the tablets will be the „master“ which holds the configuration and the songs. The „slaves“ only require a thin layer for transport the input and output data. Communication could be done via bluetooth or wifi. Answer: I am adding two pages up at a time, but the other features you’ve mentioned are pretty extensive. I’m not sure when I will try to tackle them yet. Support for „native keyboards“. When entering text you only have the virtual keyboard. Supplying other input formats would be nice:speech input and pen writing. Answer: Speech input is naturally built into the Android OS, is it not? There is usually a microphone button on the keyboard for this (I don’t have my tablet to verify this). I also support voice-based searching for songs already as well. As for native keyboards and pen writing, these are also OS things. If I plug the keyboard into my ASUS Transformer, it works automatically. I don’t know if you can plug in any usb keyboard, but in theory, my app shouldn’t have to change at all to support this if the OS supports it. After that explanation I found the way of „entering text by speaking“. Nice. #63: Export the metadata (title, artist, notes, …) as plain text (CSV, XML) for further processing. I think there was such a feature request already … Answer: This will be tackled along with the other sharing features. #64: Table overview of all notes. So you could create a „todo list“ from all saved notes. Answer: Are you saying you want a list on the library screen of notes taken for every song? I can consider adding this if it would be useful to people. #65: Custom stamps. E.g. a danger sign, glasses – so the musician knows to have a deeper look. Answer: User provided custom bitmaps are still on my list of things to finish adding, along with converting the existing implementation to use fonts instead of bitmaps for the core symbols. Another good tool is Mobile Sheets Companion. This is a program for your PC for managing the data on your tablet. It is much easier to import files or enter text with a ‚real‘ computer than with a tablet. MS-C is available without additional charge and requires a connection to a running MS instance. Connection could be established via USB or Wifi (I choose Wifi because that’s much easier). scan2pdf: Scans one or multiple pages into a PDF file. After the first iteration I decided to stay at this combination (Mobile Sheets on Hannspree), so I purchased the full version. For 10.1″ tablets there are lot of stands like the K&M 19742. 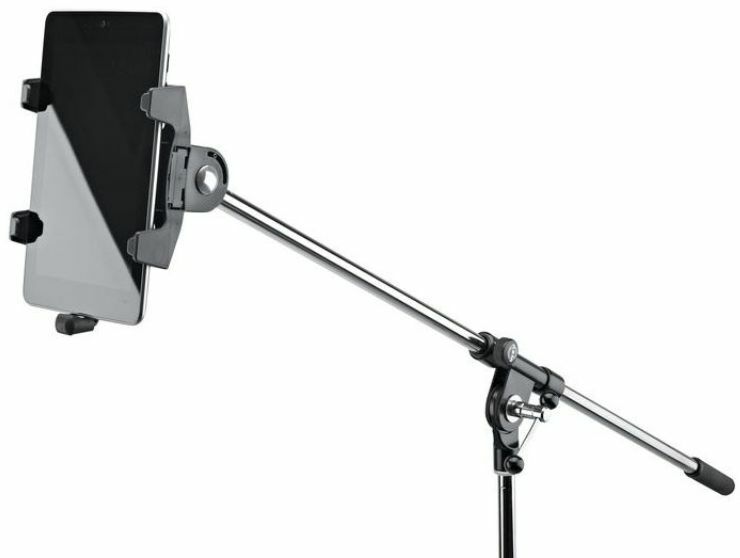 For a 13″ tablet I haven’t found a good stand yet. So I place that on my usual music stand.